Outside of the popular platformers for which he was first known, Nintendo is always more than happy to take advantage of Kirby’s robust, rotund appearance for spin-offs. In the past the happy little chap has been flipped and lobbed about in Kirby’s Pinball Land and abused with golf clubs in Kirby’s Dream Course. It was never a huge shock, then, to see him smashed into all manner of surfaces in a Game Boy Breakout clone. Poor little guy. 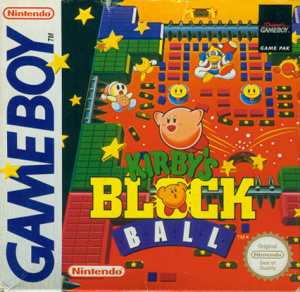 Kirby’s Block Ball takes the brick-breaking classic and sprinkles it with more than a little Dream Land glitter. The basic Breakout elements are retained — you bounce Kirby, curled into a tiny ball, off a paddle to destroy a myriad of blocks — but in addition many of the Kirby franchise’s trademarks are featured, mixing up the formula in a way that feels natural. The infusion of Kirby makes for a more visually enticing product too; the whole thing’s painted with the cuteness that helps the series maintain its popularity. The action always begins at the bottom of the screen, with an unrecognisable Kirby perched nicely on a paddle that skids along a deadly pit. An arrow demonstrates the possible angles of his launch, and with correct timing he can be sent on his merry way in a direction of your choosing. 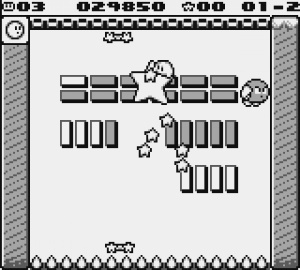 Blocks are broken and Kirby is bounced back and forth until the screen is cleared, paving the way for the next level and giving the cheerful fellow ample opportunity to perform his traditional victory jig, before the pain of being slammed into and through concrete sets in. Kirby’s Block Ball has a few tricks behind its bricks. Tapping A as Kirby hits the paddle gives him a boost, allowing him to temporarily unfurl into a larger, more damaging projectile and affording him a small window of invulnerability. Multiple controllable paddles are soon introduced, one for each wall of the play field, which gives a greater degree of control while upping the hazard potential. The side paddles are shifted with presses of up and down, the ceiling and floor adornments with left and right; each set, as with all the game’s controls, responds as perfectly as required. Returning enemies patrol many of the stages, most knocked out with a simple smash, and some of them hold special abilities that can be stolen with Kirby’s absorption powers to make things that little bit easier. Fire Kirby can stop dead in the air wherever you press B and hurtle in a straight vertical line up the screen, burning up anything breakable in his path; Spark Kirby can unleash electricity around him; Stone Kirby acts similarly to the flammable form, only in a downward motion. They act as shields too, allowing the puffball to take one extra trip to the spike pit before surrendering a life. Each world is also capped by a boss battle featuring a larger enemy snapped right up from the platform titles, such as the ever-present Whispy Woods and all-seeing cloud Kracko. Other familiar items include bombs that blow away particular, otherwise indestructible, bricks, and warp stars that jet Kirby off to Bonus Land. 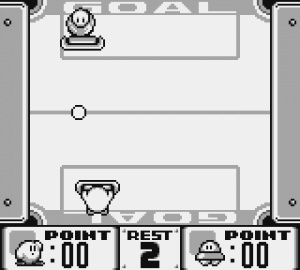 Once there you can choose one of four mini-games to play for extra lives: there’s the self-explanatory air hockey, one where a slightly — and perhaps justifiably — vengeful-looking Kirby takes up residence in the centre of the screen and viciously flings stars to be caught with the paddles, a game where four piles of cards are bashed away until all the images match, and a cloud-bouncing aside. They’re all well-put together and add variety, making you work for those 1-Ups through fun distractions. 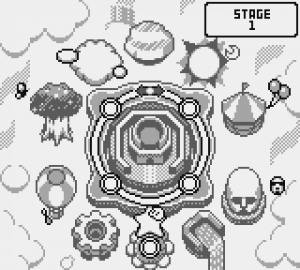 Each of Kirby’s Block Ball’s 11 worlds adds something new, such as a fresh power or block type, which stops gameplay from getting stale over the course of the three hour campaign. Despite this, a rigid structure does become apparent very quickly: in the first of the five stages you’ll play with the new element, then the second and third get progressively more difficult, before you face a mini-boss in the fourth and a big boss in the fifth. This means that it’s quite predictable, which undermines the numerous changes and additions elsewhere. Working the angles is the way to success, but all too often during Kirby’s Block Ball you’re left crossing your fingers as the stages become more complex and reliant on the use of power-ups. Later worlds are filled with blocks unbreakable by Kirby’s bulk, only succumbing to the explosive charms of bombs tucked in the recesses of long tunnels. From time-to-time you can pass Kirby off and sit waiting for 10 to 20 seconds before there's another chance to do anything but watch him bounce around the same paths, which is never very invigorating as a player. For £2.70 on the 3DS eShop, though, Kirby’s Block Ball can’t be disregarded as a decent chunk of entertainment. A first play lasts three hours — and it’ll take most players longer to surpass each world’s benchmark high score, thus unlocking the final world — and there’s replay value to be found in score-making. The classic gameplay of Breakout and the delights of Kirby’s presentation, music and unique power-ups come together well, even if there can be a tad too much waiting and hoping in later worlds. May well buy this, looks good. Looks good for a game of a 2.70 price tag. wow this is a steal!!!! Why does Nintendo of America hate their customers? I wouldn't exactly say NOE is showing us love with YET ANOTHER below-par Kirby game that a minority kids enjoy. This and Mole Mania need to come to North America. Then I don't care what happens. This isn't below par. There are no below par Kirby games on the Game Boy. I always thought it was a decent little game. Not the best in the series, but still fun. Best ₤2.70 I've spent on the VC yet. Doesn't look like much from screenshots but is surprisingly addictive when you're playing it. For me the jury's still out whether or not I should get this. But hey, I'm certain it beats Alleyway hands down. The best block breaker game ever. So much variety and control over the ball can´t be found elsewhere in the genre. 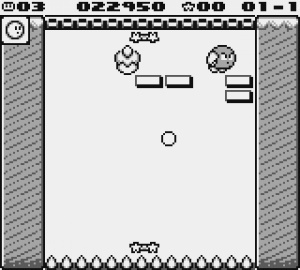 I would give the original a 9 but since the colors and other features of the Super Game Boy aren´t supported on 3DS I´d give this version a 7 as well. So this like an improoved version of Allyway. I bought this the day it came out on VC. As part of my plan to build up games I can't experience on PC & iOS this hits the spot. The music graphics and ever evolving gameplay are great. I think a 7 is very fair but I'd still give it an 8 after 4 hours play. It's a pity it's only in B/W but don't let that put you off for £2.70 it's a must buy! I'm unsure if there is a better VC game at that price point ? Nice review! As I expected: Not a must-have, but worth downloading someday nonetheless! Played this a lot when I was a kid so...I can't resist. Hoping for the NA release soon. Damn you Nintendo! When are you going to start supporting Super Game Boy? It's the best breakout style game I've ever played but the lack of control over the direction you send the ball can be extremely frustrating. It seems set to specific angles to three angles for each direction and that doesn't necessarily seem to correspond to where on the paddle the ball lands. Great review. I'll pick it up at some stage but I'm waiting for Mutant Mudds to arrive on the European eshop. Downloaded this game right after reading the review. Turned out like i thought it would and i immensely enjoy everything Kirby. Star Stacker and Tilt 'n' Tumble next please. PS: Amazing About-box you've got there, @Mike. @Groovius mate, you've got VVVVVV, Sakura Samurai, Mutant Mudds and Cave Story - games that the UK/EUR zone are STILL waiting for. And you're moaning over a Kirby spinoff?!! Good to see most people enjoying this! World 8 for me now and it's been growing on me. After my short disappointment now i can also feel that this is a very good game. As a huge fan of Breakout-kind games i'd give it an 8 / 10 atm. For three bucks, I think I will do this. Been playing Spirit Tracks again (hoping to finally beat it someday), but this will be a fun little new distracting game when I want a break for that one. Bah, I much prefer AlphaBounce (DSiWare) to this one. More stages, more options, more everything. Maybe it's an unfair comparison, but hey. This was well worth the wait. It's one of the most addicting Kirby Spin offs I have ever played! This was the first game I bought for my GameBoy as a kid after Pokemon Blue. It was excellent then and it's excellent now. I'd say 8/10 but that last point might be nostalgia. I think it deserves an 8/10, to be honest, but otherwise, this was a great review.